Limiting your intensity isn't always the right approach. If you’ve ever used a cardio machine at the gym, you’ve probably noticed a colorful heart rate zone chart on the console. The chart suggests different heart rate ranges for your workout, depending on whether your goal is to improve cardio endurance or burn fat. One of those zones is labeled the “fat-burning zone,” which is supposed to tell you the intensity at which you’d need to exercise for your body to burn more fat than carbs. It's a little more complicated than that, but worth understanding. (Hear us out.) The fat-burning zone, exercise scientist Mike Young, Ph.D., director of performance at Athletic Lab Sports Performance Training Center in Cary, North Carolina, tells SELF, is when you’re working at about 55 to 70 percent of your maximum heart rate (max HR). Or, you can think about it this way: It's when you're putting in an effort of about a 5 or 6 on a scale of 1 to 10 (with 1 being complete rest and 10 being going as hard as you possibly can). This is what those treadmill charts are getting at. But the phrase “fat-burning zone” is misleading (though admittedly, very enticing). The problem is that, presented without context, you might conclude that limiting the intensity of your workouts will result in burning more fat, but that’s not really the whole story. Before we dive in, let's just establish how your body burns fat in the first place. Our bodies are always working to turn both carbs and fat into energy our cells can use. This energy production is constant, and the dominant energy source changes depending on what we’re doing and lifestyle factors like what we’ve eaten most recently. “In most cases, the body is going to choose what's readily available in abundance,” Paul Arciero, D.P.E., professor and director of the Human Nutrition and Metabolism Laboratory at Skidmore College and fellow of the Obesity Society, tells SELF. For example, if you eat a high-carb meal right before exercising, chances are your body will rely on those carbs first for energy, no matter the intensity of your workout. Energy production is a complex process that’s happening every second of every day—and our bodies are smart machines that generally operate in the most efficient way possible. Like we said: complicated. But the bottom line is that when you do high-intensity exercise, you're still going to be burning fat. You're just going to also be burning carbs, and probably in a higher proportion. Now that we've laid out the basics, here’s what you actually need to know about the fat-burning zone and how to make the best use of it in your workouts. It’s true that when you work out at 55 to 70 percent of your max HR, your body uses more fat than carbohydrates for fuel. Science lesson time! Our bodies primarily burn fat and carbohydrates for fuel. Through a few different biochemical processes, our cells convert these nutrients into a usable form of chemical energy called adenosine triphosphate, or ATP. As we've already discussed, whether we burn more fat or more carbs to create ATP depends on our level of activity (though other factors like diet and hormones come into play, too). Here's why: Our cells need oxygen to turn fat into ATP; when we’re at rest and breathing normally, oxygen is readily available and we can metabolize fat at a slow and steady pace. “When we’re at rest, the body is definitely geared and driven toward oxidizing, or burning, its major fuel source, which is our stored fat,” Arciero says. “Any time the body is at homeostasis, it is saying, ‘I need to do the smartest thing possible in order to survive so I’m going to draw energy from the greatest fuel depot in my body, and that’s stored body fat.’” Not only is fat abundant, it's great at providing slow-burning energy, which makes it perfect for fueling our brains and bodies when we're at rest (which is often) or working out at lower and moderate intensities. The more intensely you exercise the more your body turns to carbs for energy. The harder you go, the more quickly your body needs to turn nutrients into ATP. We can do that with carbs more efficiently than we can with fat because we don’t always need oxygen to convert carbs to ATP. In fact, our bodies tend to preserve carb stores for when oxygen is scarce but we really need the energy. Again, our bodies are very smart machines. So, to sum up: As exercise intensity increases, the proportion of fuel that comes from carbs also increases, while the proportion from fat decreases. Remember, you're still burning both carbs and fat, it's just that at a certain point, you start burning more carbs than fat. That turning point is different for every person and it can vary from day to day or workout to workout; it depends on when you start breathing harder and harder to keep up with how intense your workout has become. When that happens, you aren’t taking in enough oxygen to burn fat, so your body turns to carbs for energy. When you work out at a high intensity, you burn more calories overall. Higher-intensity exercise pushes multiple systems in the body—including the cardiovascular and respiratory systems—to work harder and faster so that we can keep moving and functioning at this intense level, Arciero explains. For example, the heart has to contract quicker to supply enough blood (which carries oxygen and nutrients) to working muscles; the respiratory system has to work harder and faster so we can breathe at this rapid pace. Any time our organs and muscles have to work harder than normal, they’ll need more energy (or, calories) to do so. To understand this better, think about walking versus running, suggests exercise physiologist Pete McCall, M.S., C.S.C.S., host of the All About Fitness podcast. Walking, you’ll primarily metabolize fat for fuel, but you will burn fewer calories than if you had run the same distance. Plus, “in the time it takes to walk 3 miles, you could probably run 4.5 miles,” increasing your caloric expenditure even more. So, at the end of the day, if your goal is to burn fat, burning more calories overall is more efficient than working out at a lower intensity to stay in a so-called fat-burning zone. When you up the intensity, you can burn just as much fat, if not more, in less time—even if carbs account for a larger percentage of your overall calorie burn. Bonus: High-intensity exercise also increases how many calories you burn in the couple days following exercise, which is known as the afterburn effect. McCall says that people tend to overestimate the effects of afterburn, but it does exist, albeit as a minor factor in your overall calorie expenditure. Mixing high-intensity workouts with more moderate workouts is the best way to burn fat in a safe, sustainable way. Challenge yourself when performing cardio intervals on all of our 4 cardio machines: Treadmills, Cybex Arc Trainers, WaterRowers, AirDyne Bikes. Accomplish a combine total of 40 minutes in Zone 3/Zone 4 during our 50 minute class. When entering into Zone 5, just be careful and monitor how you feel. 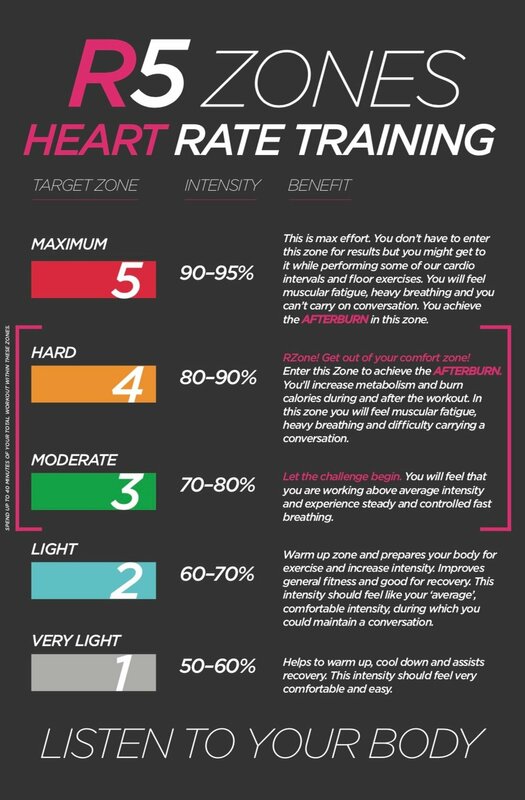 As mentioned this will be the least amount of the target heart rate zones you will be placed into.For beginners, Zone 3 at 70% to 80% is fantastic. Always focus on recovery and listen to your body. When performing our strength training exercises use a resistance/weight that will challenge your muscles. You want your muscles to experience momentary muscle failure but not at the expense of losing your form. As with cardio intervals, focus on recovery perform you move onto the next exercise and listen to your body. Increase your workload: Increase resistance, repetitions, effort and if you can transition from one exercise to the other with minimal rest period. But, first and foremost focus on the particular exercise and then try to transition to the next movement as soon as you can to increase workload. As always, listen to your body, do not sacrifice form and do not race through an exercise. Focus on supportive nutrition. We focus on teaching you the concepts and strategies of supportive nutrition by eating lean protein to match your lean body mass, adequate complex carbohydrates to provide energy to working muscles and your brain so you can perform amazing in the target heart rate zones, quality vegetables, fruits, essential fats and water to keep yourself hydrated. The key is to start with what you can handle and slowly build from there. And, if you're just getting started, don't worry too much about how hard you're working. Focus more on making exercise a habit you can keep up with on a regular basis.